The National Institute of Sciences of India , now the Indian National Science Academy, was inaugurated on 7 January 1935 at Calcutta and functioned with its HQ at Asiatic Society of Bengal till 1951 and there after shifted to Delhi. The Indian National Science Academy was established in January 1935 with the object of promoting science in India and harnessing scientific knowledge for the cause of humanity and national welfare. The foundation of the Academy, earlier known as the National Institute of Sciences of India (NISI), was the outcome of joint endeavours of several organizations and individuals and the Indian Science Congress Association (ISCA) playing a leading role in this regard. which was requested to submit a detailed report for consideration at the next session of the ISCA. The committee submited the report in January 1935 incorporating . (i) the aims and objects of the national scientific society to be formed; (ii) draft constitution; (iii) names of 125 Foundation Fellows selected by a Special Committee of Specialists; and (iv) names of 25 scientists as members of the provisional Council of Academy. The report of the Academy Committee was placed by Dr LL Fermor (President,22nd Session, ISCA) before a Special Meeting of the Joint Committee on January 3, 1935. : The recommendations of the Academy Committee were accepted by unanimous resolution by the ISCA and the foundation of the National Institute of Sciences of India as an all India body of scientists was thus laid. An inaugural meeting of the National Institute of Sciences of India (NISI) was held on January 7, 1935 under the Chairmanship of Dr JH Hutton (President, 23rd Session, ISCA) in Calcutta, and the Inaugural Address was delivered by the first President of NISI, Dr LL Fermor. The Institute, thus, started functioning with its Headquarters at the Asiatic Society of Bengal, 1 Park Street, Calcutta, from that day. The issue of the Government recognizing the NISI as the representative body of the scientists was taken up after ten years of its foundation. After due deliberations and discussions, it decided to recognise the National Institute as the premier scientific society representing all branches of science in India in October 1945. The Headquarters moved over to Delhi in May 1946, and the Government commenced providing increased grants to meet expenses on travel, publications, research fellowships, and for allocating grants-in-aid to other scientific societies for bringing out their publications. A capital grant for the Headquarters building was also sanctioned in 1948 by the Government. The foundation stone of the building was laid by Pt Jawaharlal Nehru, the then Prime Minister of India, on April 19, 1948. 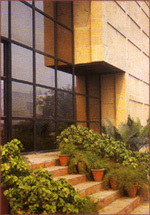 The Office of the NISI moved to its present premises on Bahadur Shah Zafar Marg, New Delhi in 1951. It was designated as the adhering organization in India to the International Council for Science (ICSU) on behalf of the Government of India in January 1968. The name of the National Institute of Sciences of India was changed to the Indian National Science Academy (INSA) in February 1970.